iPad is way better than iPhone for watching videos or viewing pictures, not only because iPad owns a larger screen, but also because the tablet has higher screen resolution and PPI which makes it display the frames and pictures sharp and clear. Therefore, many people will transfer photos they take with their iPhone or digital cameras to iPad for an enjoyment. 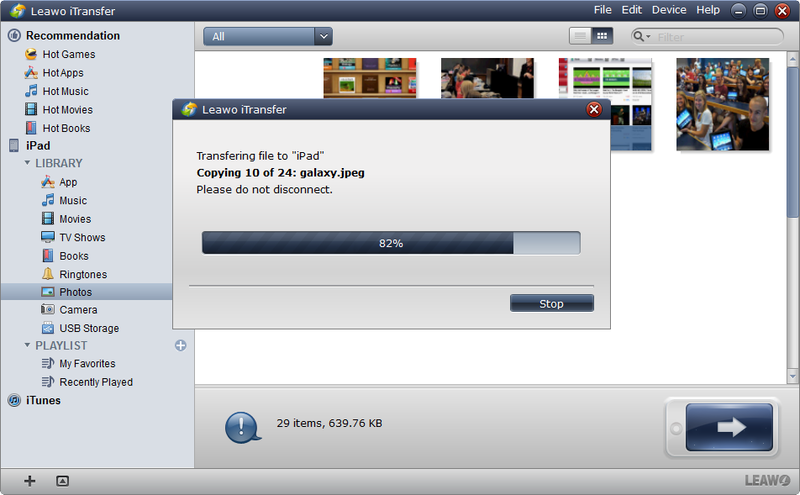 If you are wondering how to transfer photos from iPhone to iPad, there is a simple method for you. You can use iCloud Photo Stream to sync photos between your iPhone and iPad. You need to enable the Photo Stream function both on your iPhone and iPad with the same Apple ID. Go to Settings > iCloud > Photos and tap “Photo Stream” to ON both for your iPhone and iPad, and then the latest photos you take with iPhone will be synced to your iPad. The photos in Photo Stream will not be saved in your iPad, so if you want to copy the photos to your iPad, you will need to email them to yourself. If you are photographic lover and have taken a lot of photos with your digital camera, you may want to view them on your iPad. It is easy for you to copy the photos from your digital camera to computer, but how to transfer photos from computer to iPad? You can find many interesting ways to get the job done, but I’ll suggest four simple and easy-to-go ways for you. If you have installed Dropbox on your iPad, copying photos to iPad will be easy for you. You only need to download and install a Dropbox on the hotel PC and then log in your Dropbox account. 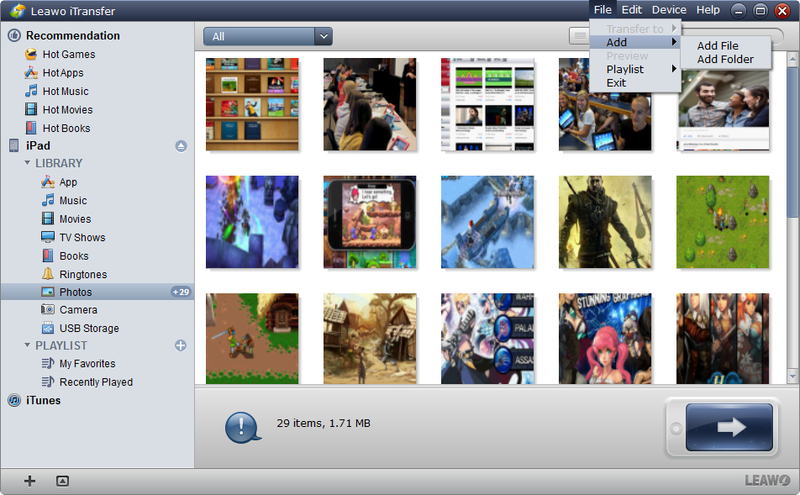 This software gives you 2GB for free so you can add photos from the PC to Dropbox and then download them to your iPad. The steps about how to copy photos to iPad are also easy. 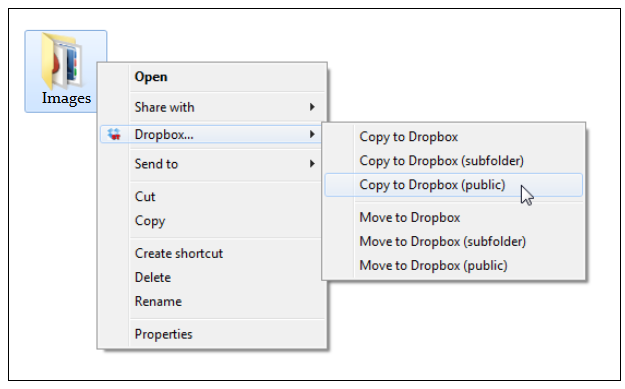 Launch Dropbox on the PC, and then log in the account you own. If you don’t have a Dropbox account, you can check “I don’t have an account” and create a new one within the software. Click the folder of Dropbox on the PC. I’m using a Windows 7 PC, and the folder named Dropbox is in C: > Users > Administrator. Copy the photos into the Dropbox folder. Open Dropbox on your iPad. If you don’t have the app, download it from App Store. Dropbox is a free app in the App Store. I suggest you download the app and copy photos to iPad over Wi-Fi connection, because the photos you take with your digital camera are usually large in size. In the Dropbox app, you are able to find the photos. Tap the file names and copy them your iPad. The photos will be saved to the Camera Roll of your iPad. With Dropbox, you can copy photos to iPad without iTunes, and the 2GB is large enough for you to save the photos you’ve taken. This app is cool and you are not only allowed to transfer photos, but also other files, like apps, movies and so on. When it comes to copying photos to iPad, iTunes is always regarded as a good choice for many iPad users. 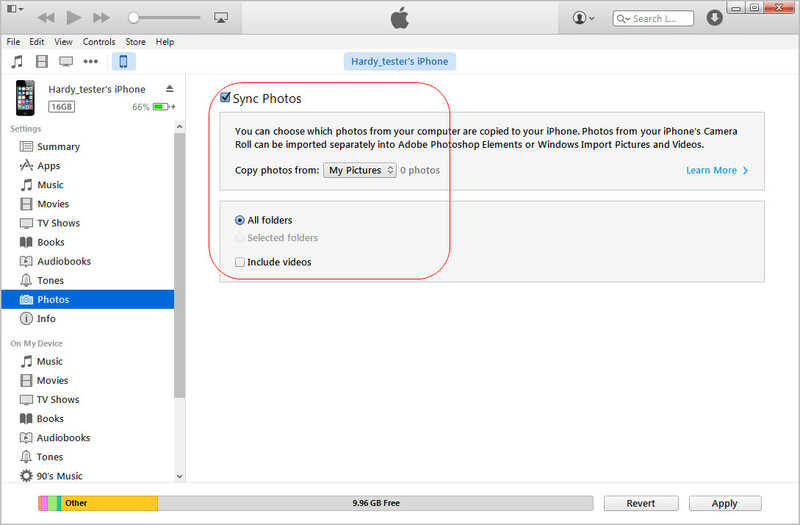 As an official and free data transfer tool, iTunes can help users to sync photos from computer to iPad. The following guidance is about how to copy photos to iPad with iTunes. Plug iPad into computer with the USB cable. iTunes will automatically launch, if not, you need to manually start it on your computer. Click the name of the iPad in the left sidebar, and then click “Photos” in the right part of the window. Click “Sync Photo from” and check “Choose Folder”, and then choose the photos from your computer. Click “Apply” at the right bottom of iTunes window. iTunes will then start syncing the photos from computer to your iPad. If you haven’t enabled auto sync of iTunes on your computer, just go to Edit > Preferences > Devices, and uncheck “Prevent iPods, iPhones and iPads from syncing automatically”. Note: iTunes is a double-edge sword. iTunes has very strict content management system, and the software never allows users to transfer files which are not got from iTunes back to computer or iTunes Library. So when you transfer photos from computer to iPad, iTunes wants to sync with your iPhone. Once syncing with it, you may lose the files which are not got from iTunes. With the iPad Camera Connection Kit, it’s incredibly easy to download photos and videos from your digital camera to your iPad so you can view them on the gorgeous iPad display and share them with family and friends. 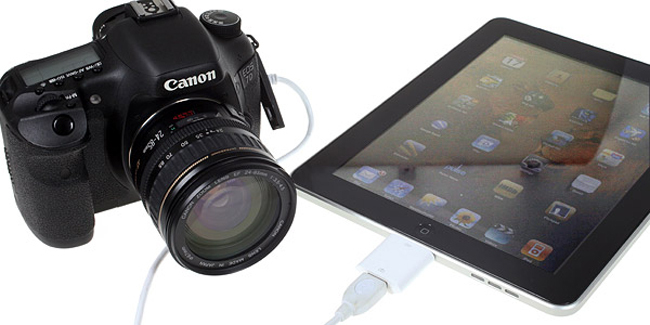 Put the storage card of your digital camera into the iPad Camera Connection Kit. Both the SD card and the other storage card of camera can be put in the iPad Camera Connection Kit, so don’t worry about the size of the storage card. Plug the iPad Connection Kit into iPad, and then the Photos app on your iPad will launch automatically. You are able to view the photos with your iPad. Select the photos you want to transfer to iPad, and tap “Import” or “Import All”. Then the chosen photos will be imported to your iPad. If you think the above three methods are still a little complicated, you can check out third party iPad transfer software. Leawo iTransfer is highly recommended on this issue. This software is used for transferring files among iOS devices, iTunes and PCs. Although the software still requires you to download iTunes to make it work, you don’t have to launch iTunes at all. The following guidance will show you how to copy photos to iPad with Leawo iTransfer. The software is shareware so you are able to free download and use it, but it limits you on the transfer times. Run Leawo iTransfer and connect iPad to the PC with the USB cable. The software will recognize your iPad and automatically detect it, and then show the libraries of your iPad in the left sidebar. Choose “Photos” in the left sidebar. You are allowed to drag and drop the photos into the window of the software to start the transfer. Or click “File > Add > Add File/Add Folder” to add photos from your computer. 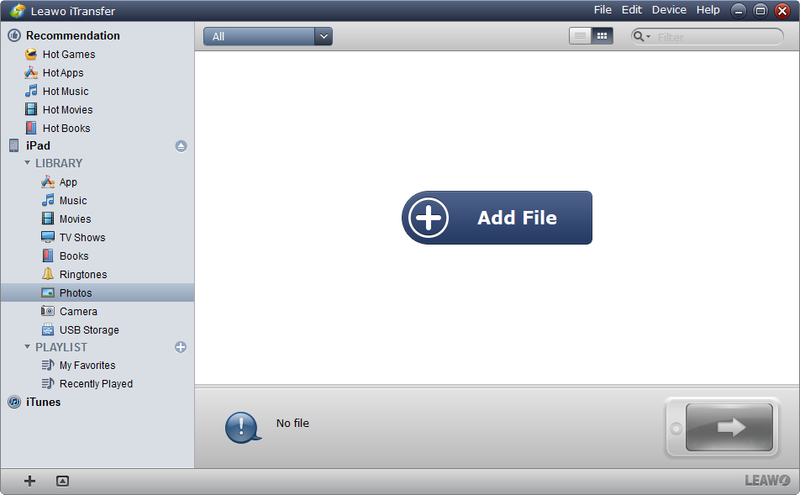 If the Photo Library of your iPad is empty, an “Add File” button will be shown in the middle of the window. The photo transfer starts immediately after you chose files. The dialog of the transfer process will show up when the transfer begins. The progress bar will show you the percentage of the transfer. When it finishes, you will find the photos are added into the window of the software, meanwhile, they have been copied to your iPad. With Leawo iTransfer, you are able to copy photos to iPad without iTunes, and the software makes the data transfer easy to be done. If you want to transfer apps from iPhone to iPad, this software will also be helpful. Check the software out if you are interested.